in its students habits of thoughtfulness, curiosity, creativity, and independent critical thinking. These core values are expressed in the extraordinary vitality of our academic culture—a vitality that is difficult to capture on the page. A visit to campus will reveal classrooms, laboratories, and art studios that are at once lively, playful, and intellectually serious, and students who display a sense of wonder and are motivated and deeply engaged in their work. Indeed, it is this high level of academic engagement—a quality educational research suggests is a precondition for success in college and professional life—that most distinguishes our graduates. At St. Andrew’s, students don’t simply “study” academic subjects; they work, under the careful guidance of our faculty, as apprentice scholars and artists. Through this process, students discover the joys and pleasure of authentic inquiry— an experience, we hope, that will sustain them throughout their lives. Goals of Our Academic Program +	Students learn to think independently, creatively, and critically, and to persuasively articulate their thoughts. +	Students engage with ideas and contexts beyond their immediate experience, and become aware of their place in a world of diverse histories, philosophies, religions, cultures, and narratives. +	Students develop a firm foundation in computational skills, quantitative analysis, and rigorous scientific methods. +	Students gain a solid grounding in at least one foreign or classical language. +	Students understand nuanced ethical and moral issues and make judgments with both sensitivity and courage. CONVERSATION AS A MEANS TO LEARNING Engaging in conversations, whether in the classroom, around the Harkness table, on dorm, in the Dining Hall, or elsewhere, allows students the opportunity to learn to listen carefully, think nimbly and objectively, see undiscovered connections, speak with respect for others, and become open to criticism. Our School mission engenders a diversity of perspectives in all areas of campus life, and this diversity becomes an invaluable tool in our discussion-centered classrooms, where St. Andrew’s students encounter new viewpoints and interpretations, learn to reevaluate and strengthen their own thinking, and develop the ability to resist defensiveness and closedmindedness. As our community feeds into our classroom, students come to understand that responsible argumentation and debate can occur only when participants are informed by a multiplicity of perspectives. This approach to learning, centered on both living with and interacting with others, keeps both students and faculty thinking and rethinking our ideas and beliefs. Only a visit to St. Andrew’s can provide a view into the extraordinary vitality of our campus dialogue. structure through which students can move from classroom dialogue and experimentation in the earliest years of study, to fully independent work in the VI Form year. This way of learning allows students to not only gain a deeper understanding of the subject at hand, but also to discover connections between disciplines, and to develop resiliency and strong communication skills. Students graduate prepared to tackle the challenges of advanced work on the collegiate level. +	In III and IV Form introductory math courses, students are asked to solve problems like mathematicians. Through collaboration, example, and practice, students learn to move beyond the straightforward application of mathematical rules; to use abstract reasoning and creativity to take on problems they have not explicitly seen before; and to experiment with known data to find paths toward possible solutions. +	Our history curriculum requires all first-year students to take “Research Challenges,” an American history course centered around the reading and analysis of primary sources. First-year history students develop their own questions and arguments about primary sources, and critically evaluate others’ claims about the past. +	Physics courses use the Modeling Instruction pedagogy. Students gain an understanding of the physical world by constructing and testing scientific models, using these models to describe, explain, predict, and control physical phenomena. First-year physics students develop a solid foundation in verbal and written scientific argumentation; advanced physics students gain an understanding of Newtonian mechanics and use an atomic model of matter throughout the year—qualities that demonstrably distinguish these courses from traditional high school physics. students to demonstrate deep understanding and authentic exploration of complex questions, issues, and challenges. AS courses teach students to: +	analyze; +	develop an argument; +	write and revise; +	calculate and experiment; +	synthesize concepts; and +	think independently and creatively. Developing such skills requires a specific approach to teaching and learning that encourages studentled investigations, experimentation, drafting, and collaboration, rather than teacher-led lecture and rote learning. Each year St. Andrew’s engages with collegiate faculty and educational leaders to review the content and rigor of courses, evaluate the strategies and approaches used by our departments, and assess the scope of student learning. This collaboration is an opportunity for invaluable dialogue on the craft of teaching, evolutions within individual disciplines, and the progress of our students’ education after St. Andrew’s. and provide a culminating academic experience for VI Formers as they work closely with a faculty member on a topic of their particular interest. Tutorials meet slightly less frequently than regular classes, but are reading and writing-intensive. Students are required to write weekly essays which they read aloud, critique, and debate with their teachers and classmates, in the spirit of the Oxford tutorial system. The tutorial framework allows students a degree of academic independence that more closely approximates the collegiate experience, and an opportunity to further hone their analytical, problem-solving, and written and oral argumentation skills. ENGAGING WITH THE WIDER WORLD St. Andrew’s students involve themselves in the issues and concerns of our day through both academic work and community service. Faculty across all disciplines connect students with leaders and professionals, through in-classroom visits or off-campus excursions, to discuss contemporary concerns in their field. Throughout the semester, students also attend talks given to the entire School community by visiting speakers, many of whom note, after a visit, the profound and unique level of engagement our students bring to these talks. Coursework encourages students to engage in activism and consider how they might impact public policy, and to conceive of solutions to social, economic, and political issues. The vast majority of students also choose to participate in weekly local community service opportunities, and modern and classical language students have the opportunity to participate in foreign travel and community service during spring or summer breaks. Social Engagement in Our Classrooms E	English 4 students FaceTime with leading contemporary Lebanese artist Walid Raad (whose first comprehensive American survey was recently on display at MoMA) about history, storytelling, and traumatic memory. E	Global Studies students write letters to their respective congresspeople, critiquing their stance and actions on climate policy. E	Intro to Biology students travel to Cape Henlopen State Park to meet with researchers and learn about ongoing changes to local dune and forest ecosystems. E	AS French students draft proposals to NGOs that address a particular need in the Francophone world, and present proposals to a panel of outside experts. E	Author and innovator Alec Ross meets with STEM classrooms to discuss “industries of the future”— biotech, artificial intelligence, cybersecurity—and how students can best equip themselves to enter our shifting economy. COURSE PLANNING & PLACEMENT Students plan the next academic year’s course schedule in the early spring of the preceding year with the help of their faculty advisors. Course selection is based not only on the next year’s requirements, but also on the student’s academic goals for his or her remaining years at St. Andrew’s. After consultation with advisors, parents, other faculty and, in the V Form, a St. Andrew’s college counselor, students submit their class selections to a committee composed of the School’s Academic Deans, Director of College Counseling, and academic department heads for final review. For incoming students, the Academic Deans, academic department heads, and School Registrar will examine the student’s previous course of study, transcripts, and recommendations to help determine proper placement in St. Andrew’s courses. New students may also be asked to take online placement tests in mathematics and foreign language before arriving at St. Andrew’s; such tests are typically administered in May or June. is used at over 200 colleges and universities across the country, assesses students’ readiness to think critically, adjudicate between competing hypotheses, and present their conclusions in a clear and compelling way—skills crucial to college, work, and civic life, and skills prominent in a St. Andrew’s education. Students take this test at the beginning of the III Form year and in the spring of the V and VI Form years. STANDARDIZED TESTING Students take standardized tests as the School recommends for college preparation and admission. Our IV and V Form students take the PSAT, which for the V Form serves as the National Merit Scholarship Qualifying Test. In their V and VI Form years, students generally take the SAT, the ACT, and at least two SAT subject tests. Students may take Advanced Placement examinations in various subjects; some Advanced Study courses will prepare students for these tests, but in most cases students will have to study for AP tests independent of general class instruction. TECHNOLOGY St. Andrew’s academic program makes effective use of technology in all disciplines. On-campus WiFi and nearly 100 networked computers located in classrooms and laboratories across campus provide students and faculty with internet access, email accounts, file storage, printing services, and specialized academic software. In addition, students have access to WiFi in the dorms during the day and in the early evening. The School’s Irene duPont Library also houses a wealth of technological resources, many of which are available for checkout. Faculty are encouraged to incorporate the School’s technological resources into their curriculums. Faculty and students also use the learning-management system Canvas, which allows students detailed access to their courses, coursework, and assignments, and allows faculty to provide more immediate and continued feedback to students. IRENE duPONT LIBRARY At St. Andrew’s, students learn to be mindful users of technology—not just consumers of content, but creators, able to discern when, where, and how technology can best be employed. ¤	Physics students use blogs to record and reflect on their work, which in turn connect them with professors and science writers across the country. ¤	Choral students learn from online interactive theory and sight-reading resources, while instrumentalists record and submit their practice sessions for feedback from their instructors. ¤	Students in “flipped” mathematics classrooms view mini-lectures online and clarify, refine, and apply their understanding in collaborative problem solving during class time. ¤	Both within computer science courses and as extracurricular exploration in other courses, students use School resources to develop software projects and apps of direct use to the School community. Honors Chemistry: 8:30-9:45 A.M. Break: 9:45-10:15 A.M. Honors Problem Solving in Algebra 2 & Trigonometry: 10:15-11:30 A.M. Advisee Lunch: 11:30 A.M.-12:00 P.M.
School Meeting: 12:00 P.M.-12:45 P.M. English 3 12:45-2:00 P.M.
AS 20th Century History: 2:15-3:30 P.M. Meet with Sra. Davila to Discuss Spanish 4 Paper: 3:30 P.M.-4:00 P.M. Varsity Football Practice: 4:00-5:30 P.M.
Dinner in the Dining Hall: 5:30-7:00 P.M. Noxontones Rehearsal: 7:00-8:00 P.M. Study Hall: 8:00-10:00 P.M. On Dorm: 10:30 P.M.
At St. Andrew’s, students learn to be mindful users of technology—not just consumers of content, but creators, able to discern when, where, and how technology can best be employed. colleges and universities throughout the year to keep fresh our understanding of these institutions, and to maintain colleges’ familiarity with the unique strengths and character of St. Andrew’s and its students. Admissions officers from a variety of colleges are invited each year to our Experience St. Andrew’s program, which provides these admissions officers the opportunity to spend a day attending our classes, meeting with small groups of students and faculty, and becoming more familiar with the culture and curriculum of St. Andrew’s. We also host around 70 individual visits from college admission representatives during the fall semester; these representatives meet with students informally and provide an overview of their respective institutions and application processes. diametrically opposed; they are, rather, essential extensions of each other. We believe that all students (not just the naturally athletic) benefit from the collaboration, resilience, and selfdiscipline required by participation in team sports, and we believe that St. Andrew’s academics benefit when students bring the leadership, self-confidence, and responsibility they’ve developed on the field, into their classrooms. The goal of St. Andrew’s athletics is to build character in our students— character that our students can then draw on in any situation at school or in the wider world. For these reasons, we stress participation and personal growth at every level of performance. Students are required to play a minimum of two sports during their III Form and IV Form years, and a minimum of one sport during their V Form and VI Form years. St. Andrew’s offers 10 sports for girls and 11 sports for boys. All sports field varsity and junior varsity teams, and some a third level, depending on demand. Most students begin their careers on lower-level teams and work their way up to varsity. St. Andrew’s competes in the Delaware Independent Schools Conference, which is comprised of six independent schools located not more than 45 minutes from our campus. We have won nearly 40 state championships in our nearly 90-year history as a School, and some of our teams have received national and international recognition. THE THREE-SPORT ATHLETE Although specialization is the current prevailing trend in American high school athletics, St. Andrew’s encourages its student-athletes to pursue a different path: that of the multi-sport or or three three-sport sport athlete. Benefits ofofbeing being a multisport a multi-sport athlete include include athlete increased increased athleticathletic skill skill and agility, and agility, lower lower rates ratesofof injury injury and burnout, and greater opportunities for leadership development and personal growth. or administrators for the School. The means that the men and women who coach our athletes on the field also work with these same students in the classroom, live with them on dorm, and guide them as mentors in all areas of their lives at St. Andrew’s. Our coaches’ holistic view of our studentathletes allows for more nuanced and personalized coaching and advising, particularly during the college recruiting process. employs two certified athletic trainers who provide immediate first aid and emergency care to students. Most postinjury rehabilitation occurs on campus under the care of our athletic trainers, in our state-of-the-art Performance & Rehabilitation Center in the Sipprelle Field House. read more about recent alumni athletic achievements and where St. Andrew’s alumni are currently playing in college, visit standrews-de.org/alumni-athletics. From 2013 to 2015, served as head coach of women’s lightweight rowing at Harvard University. In her first year at Harvard, the team was undefeated and won the IRA National Championship, where she was selected as Women’s Lightweight Coach of the Year. Has coached several undefeated and championship crew teams at Ohio State, University of Virginia, and Trinity College (which she brought to its first-ever NCAA Championship). Three-year starting quarterback for the Williams College football team. Over those three seasons (2008-2011), he led Williams to a 20-4 record, including a perfect 8-0 mark and NESCAC Championship as a senior. Spent three years coaching football at Norwich University, where he coached the quarterbacks and wide receivers, and helped guide Norwich to an ECAC bowl game in each of those three seasons. Played guard for St. Joe’s University in Philadelphia from 1993 to 1997. Played professional basketball in Europe for more than ten years, including six in the British Basketball League, where he was a four-time All-Star and the 1998-99 BBL Player of the Year. Computer Science 2: 10:15-11:30 A.M. Family-Style Lunch AS Physics: 12:15 A.M.-1:30 P.M. Photo 1: 1:45-3:00 P.M. Varsity Lacrosse Practice: 4:00-5:30 P.M. Advisory Dinner at Mr. Hutchinson’s House: 5:30 P.M.-7:00 P.M. Study Hall: 8:00 P.M.-10:00 P.M. On Dorm: 10:30 P.M.
a vital aspect of a student’s St. Andrew’s experience and of our campus culture in general. We provide our students with an environment in which they can explore their artistic interests and passions within a master-apprentice system of teaching, and without fear of judgment from peers. Indeed, the student community prides itself on its genuine and intense support of the artistic efforts of all its members, without regard for typical social expectations or level of expertise. Visual and performing arts courses provide both formal training “I was never an artistic person, and instruction in the theoretical, but St. Andrew’s changed me, historical, and cultural background of each discipline. Our students like it does so many others. I was develop their abilities while working open to trying something new, in close contact with arts faculty, so I took a male dance class. all of whom are established artists in their own right, as each pursues I love it. My classmates and I his or her own artistic practices have felt so much support from and creates and performs works the rest of the School; we’ve within and for our community. This received standing ovations master-apprentice system allows the student to grow in his artistic at both our performances. If I understanding, creative capabilities, hadn’t come to St. Andrew’s, focus and discipline, and facility I probably would have just for free expression. Whatever a student’s initial interest or abilities played sports and focused on upon arriving at St. Andrew’s, the my academics. Here, I am free end goal is for that student to leave to pursue what I like.” St. Andrew’s with the habit of —V Form student engaging with the arts as a means for investigating and celebrating the world in which she lives. THE PATH OF THE ARTIST All III Form students take Introduction to the Arts, a survey course team-taught by visual and performing arts faculty that introduces new students to each of the arts disciplines offered at St. Andrew’s. Students rotate through six-week long workshops in dance, music, theatre, and art, and also attend and write reflections upon both peer and professional arts performances and exhibits offered at the School throughout the year. Students are then required to participate in some aspect (beyond the Introduction to the Arts course) of the School’s arts program before graduation. Students can complete this arts requirement in a variety of ways: +	successful completion of any of our for-credit courses in the arts; +	participation in Noxontones (our a capella group), Choral Scholars, Orchestra, or Jazz Ensemble for a full academic year; or +	participation in the theatre or afternoon dance program for at least two terms (not necessarily consecutively). Students who complete introductory coursework in an artistic discipline may choose to further their study by “majoring” in that discipline in the V or VI Form year. Majors take a full-credit Advanced Study course in their artistic discipline that requires extensive independent work and production outside the classroom. Frequent recitals, exhibitions, and drama productions on campus allow students to share their artistic efforts with the entire St. Andrew’s community. Arts students in all disciplines also take off-campus excursions to give or attend performances, collaborate with other artists, and visit arts institutions and workshops. Concurrently, we bring the larger art world to St. Andrew’s through exhibitions by professional artists in our Warner Gallery, concerts by internationally recognized musicians and ensembles in Engelhard Hall, and regular talks, classroom visits, and workshops by visiting artists who are invited to campus throughout the year. AS History of Social Reform: 8:30-9:45 A.M. Andrean Ensemble 9:50-11:05 A.M.
Community Service: 11:05 A.M.-12:15 P.M. Lunch in the Dining Hall: 12:15-12:45 P.M. Problem Solving in Precalculus & Trigonometry: 12:45-2:00 P.M. Physics: 2:15-3:30 P.M.
Family-Style Dinner 6:00-6:45 P.M. Chapel: 6:45-7:30 P.M.
Study Hall: 8:00 P.M.-10:00 P.M. On Dorm: 10:30 P.M.
unique, thrilling, and challenging experience. St. Andrew’s is increasingly distinct among boarding schools for our commitment to an all-residential student body and faculty: 100% of our students live on campus, and 95% of our faculty do as well. We believe that the best education is one which involves not only learning in the classroom and from books, but also from deep and meaningful relationships formed with peers and mentors within the School community. Our students and alumni often note their most significant learning experiences occurred during informal conversations with friends and teachers on dorm, in the halls, or on the fields. With this principle in mind, living and working at St. Andrew’s becomes deeply rewarding for both students and their teachers. The health of any community rests on the mutual trust, respect, and understanding that exists among its members. All members of the St. Andrew’s community pledge to live by our Honor Code: We tell the truth at all times. We submit our own academic work. We do not steal. Stealing, lying, or dishonesty of any kind violates the School’s Honor Code. Any form of harassment, hazing, or intimidation is unacceptable. Student use or possession of alcohol or illegal drugs is prohibited. These parameters are supported and enforced by students as well as faculty, and are the reason our unique School culture continues to exist and flourish year after year. We ask much of our students, and give much in return to ensure their character development, intellectual growth, and overall well-being. We strive every day to be accepting and kind to one another. We celebrate good will, civility, empathy, and our common humanity. We have a sense of responsibility not only for ourselves, but for each other. We live and work together in a community that is genuinely close-knit and cohesive. And we have a lot of fun. hall is supervised by one or more members of the faculty. These “dorm parents” have primary responsibility for the students who live with them. Their homes in the dorms are open to students, and they are available and prepared to help students through all the highs and lows of their St. Andrew’s experience, and of adolescence in general. All faculty, even those who do not live on dorm, have dormitory responsibilities, and open their homes to students for advisee and Form gatherings. VI Formers act as residential leaders (RLs) on all corridors and assist the dorm parents in all aspects of corridor life: hosting functions, holding meetings, and supervising nightly check-ins. We also pair each new student with an older student mentor. Mentoring a younger student is the most important and cherished responsibility of a VI Former at St. Andrew’s. The School expects each student to maintain his or her dorm room in an orderly fashion; dorm faculty inspect rooms each morning. Each student is also assigned a daily job in a certain area of the School (the majority of which are on dorm). Each job takes five to ten minutes, and all are rotated regularly. Responsibilities include taking out dorm trash and recycling; vacuuming the halls; and cleaning common rooms and kitchen areas on dorm each morning. are thus a time when we try to momentarily slow the busy pace of our lives in order to connect and catch up with each other. Family-style meals take place during weekday lunches and on Wednesday evenings before Chapel. Breakfasts and dinners (except for Wednesday night dinner) are informal buffet-style meals. All meals feature a variety of hot and cold dishes, vegetarian or vegan dishes, gluten-free options, and a complete salad and dessert bar. We take joy in our meals at St. Andrew’s! STUDENT LEADERSHIP St. Andrew’s provides remarkable leadership opportunities for students in every aspect of School life. We confer an enormous amount of responsibility on our students; there are around 100 leadership roles—in academics, athletics, the arts, community service, and on dormitories—to which students can be elected or selected to lead the doing of good works. Opportunities for committee roles and elected positions are available to students in all Forms, with a goal of giving equity and voice to all members of our student body. All students, even those not serving in an elected or official leadership role, participate in leadership and equity training and workshops through their four years at St. Andrew’s. In School leadership roles, students are responsible for everything from organizing meetings to coordinating campus-wide events; from holding fundraisers to managing budgets; from public speaking to making group decisions with a team or a committee. Above all, our student leaders collaborate with peers, faculty, School administration, and the Board of Trustees to create a School culture and ethos that is at once dynamic and responsible, positive and innovative. In shouldering such responsibilities, our students learn principles of good leadership through practical experience. Students acquire habits of honesty, discipline, and generosity; develop organizational and creative problem-solving skills; and gain the ability to face obstacles with grace and integrity. Each year, we graduate young men and women who are both inspired and prepared to serve as leaders in their colleges and their adult communities. ADVISING St. Andrew’s takes particular pride in its advisee program, which guides each student with warmth, care, and compassion. Because our faculty are committed to every aspect of student life, they naturally serve as informal mentors to all students they come to know well through teaching, dorm parenting, and coaching. In addition, St. Andrew’s matches a formal faculty advisor to each student. The Admissions Office assigns advisors to all new students. Returning students may choose their advisor each year, and may retain the same advisor throughout their career at the School. 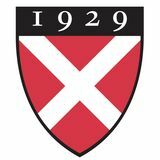 An advisor meets with her advisee regularly (typically once a week), in both formal and informal sessions, and works closely with the student to counsel him in all aspects of his life “My advisor was always at the School. Advisors also serve as the most important initial link between parents and the there for me and is the School and may communicate with parents absolute best. He helped me through conferences, telephone calls, and email. Each faculty member is typically responsible get through the hardest parts for between four to eight advisees, with the entire group colloquially referred to as an “advisory.” of my time at St. Andrew’s.” Advisories often become small family units, —VI Form student gathering for dinners at the advisor’s home, making off-campus excursions, and celebrating birthdays. Twice a month, advisories sit together for Thursday lunch in the Dining Hall. DIVERSITY & INCLUSIVITY St. Andrew’s fosters inclusivity, equity, and open dialogue in the classroom, dormitories, and all co-curricular activities. Careful exploration of our differences, coupled with regular and structured engagement in those differences, enables us to come together more effectively as an authentic and cohesive community. Our goal is twofold: to examine and understand the varied perspectives and backgrounds present within the community, as well as to consider those groups who may not be directly represented; and to develop habits of heart and mind in our students and our faculty and staff that will help us to identify biases, engage in challenging conversations, and practice empathy. The development of a culturally competent and biasaware student body is, consequently, the responsibility of every St. Andrew’s faculty member and department. Keeping this fundamental principle in mind, diversity and inclusion work aims to involve as many faculty participants as are willing to collaborate, design, and carry out programming throughout the school year. Diversity programming also aims to root itself across departments, grounding itself firmly in the daily experience of students both inside and outside of the classroom. St. Andrew’s Diversity Education Program organizes an annual student-led Equity Conference for the School community, brings outside speakers to campus, provides equity-based orientation coursework, and facilitates annual student and faculty participation in the national Student Diversity Leadership Conference (SDLC). Students can also join the entirely student-led Diversity Stewards program, in which students meet every two weeks in small groups to take part in activities and discussions that explore issues of difference, equity, and social justice. faith community to recognize and affirm our common humanity. Both our Chapel program and our community service program are rooted in our need for deep contemplation of our values and our desire to share generously with those less fortunate than we are. In all of our pursuits, we aim to instill in our students a reverence for humanity and for our earth as well as a sense of personal responsibility to use their talents now, and throughout their lives, to serve others and the world in which we live. COMMUNITY SERVICE St. Andrew’s service program is at the heart of the School’s commitment to develop habits of community engagement in our students. We believe strongly that students should serve others because they want to, not because they are required to do so. To that end, St. Andrew’s does not have a community service requirement and all student service work is voluntary; we want students to focus on lives changed, not hours earned. We offer students opportunities to get involved in service on the local, regional, national, and international levels, and more than 70% of our students answer the call to serve. During lunch on Wednesdays, students may elect to participate in one of a number of ongoing outreach opportunities in Middletown, including: +	mentoring local elementary and middle school students; +	playing bingo and baking cookies at a local senior center; and +	giving swimming lessons to physically and mentally challenged children in the Genereaux Aquatics Center. Additional weekly service opportunities include Friday night trips with faculty to serve dinner at homeless shelters in Wilmington, teaching English as a second language to our food service employees, and holding a weekly Math Circle on campus for local children. Students also participate in semiregular or annual School service events, such as: +	food and clothing drives for people in need; +	Habitat for Humanity builds; +	Delaware Special Olympics activities; +	Salvation Army bell-ringing; +	letter-writing campaigns; +	local road clean-up; +	blood drives; +	Delaware Leukemia Foundation Mud Run and other fundraising footraces; and +	service-learning trips within the U.S. and abroad. Recent trips have taken students to New Orleans, China, Costa Rica, Cuba, Haiti, Nicaragua, and South Africa. speaking; and Polar Bear Club, in which students take a monthly plunge into Noxontown Pond). The clubs named here represent only a portion of the many organizations students can join and lead. Weekends are loaded with on-campus leisure activities and off-campus excursions. Weekend activities are open to the entire School (including faculty and staff) and are organized by the St. Andrew’s Weekend Activities Group (SWAG), which is led by students from each Form and a small group of faculty. Faculty also invite their advisories or classes to their homes for dinners, movie nights, bonfires, and other group activities. Midmorning Break : 9:30-10:15 A.M.
History of Religious Thought: 10:15-11:30 A.M. Family-Style Lunch: 11:30 A.M.-12:15 P.M. Problem Solving in Geometry & Algebra II: 12:15-1:30 P.M. Acolytes Meeting: 7:00-7:30 P.M. Study Hall: 8:00.-10:00 P.M. On Dorm: 10:30 P.M. In addition to our faculty, administration and Trustees, the adult community includes our Health Center Team, Facilities Team, SAGE Dining Services Team, and numerous other support staff who all care deeply for the health and well-being of our students. Voluntary Chapel: 9:45-10:15 A.M. Physics: 10:15-11:30 A.M.
AS History of Ancient Greece & Rome: 12:15-1:30 P.M. Photo 2: 1:45-3:00 P.M. Admission Ambassadors Meeting: 3:00-3:30 P.M. Varsity Tennis Practice: 4:00 P.M.-5:45 P.M. Advisory Dinner at Sushi Yama: 6:00.-7:30 P.M. Study Hall: 8:30-9:30 P.M.
contribute to our culture of kindness and our vibrant community. If you are a bright, motivated student ready to immerse yourself in all aspects of School life with creativity, curiosity, and a willingness to collaborate, then we encourage you to apply! If you think you are interested in St. Andrew’s, but you are unsure of your parents’ ability to pay our full tuition, know that need-based financial aid is available to all admitted students who qualify through a separate, confidential financial aid application process. St. Andrew’s is affordable and accessible to all students, regardless of your family’s financial circumstance. If you are unsure of your ability to pay full tuition, you should apply for financial aid. (Limited financial aid is available to international students.) Our admission process is designed to help you get to know our School and community and in turn, we hope to learn as much about you—your academic interests, talents, hobbies, aspirations, and whatever it is that makes you, you. In the end, we are hoping to find a great fit between you and St. Andrew’s. Our Application Process 1. Come visit us! A campus visit includes a tour with a student and an interview conversation with a member of our Admission committee. Call the Admission Office at 302-285-4231 to schedule your visit; we see prospective families on weekdays when classes meet, and on some Saturday mornings. 2. Submit your application as soon as possible, and no later than January 15; submit supporting documents by January 31. You can apply online at standrews-de.org/apply. 3. Take the Secondary School Admission Test (SSAT). Our School code is 6280. International students for whom English is a second language should take both the SSAT and TOEFL. Our school TOEFL code is 8146. 4. Keep in touch! While you are waiting for your admission decision, don’t hesitate to call or email us if you have any questions, or want to share updated information with us. Be sure to visit our School website (standrews-de.org) for our latest news, videos, and photos; visit our Livestream page (standrews-de.org/livestream) to watch School events (concerts, talks, performances, etc. ); and follow us on Facebook (facebook.com/sasdelaware) and Instagram (@sasdelaware). Completed applications are reviewed throughout January and February, and admission decisions are mailed on March 10. After our enrollment deadlines, applications are reviewed on a space-available basis. Please contact us at any time with your questions or concerns about the admission or financial aid process. We look forward to getting to know you, and as we go through this process together, we hope to discover that you and St. Andrew’s are a great match. common to all students. A financial aid grant lowers tuition for qualifying families. Expenses not covered by tuition include medical and accidental insurance ($2,160/$120); technology accident/repair insurance ($65$275); textbooks ($300-$500); art course fees ($25-$250); private music lessons ($240-$480); school store purchases; prescriptions; and transportation costs the student may incur traveling to and from campus. In some cases, students may qualify for additional financial aid stipends to cover one or more of these costs. Enrollment contracts are mailed home each year in the spring, and a signed contract and deposit is required to confirm a student’s place for the following school year. Three types of tuition payment plans are available: +	Payment of full tuition, due on July 16; +	Payment of 60% of tuition due on July 16 and payment of 40% of tuition due on December 15; or +	Ten monthly installments made by direct debit from the parents’ bank account, beginning July 16. Tuition refund insurance is required if not paying full tuition on July 16. How to Apply for Financial Aid St. Andrew’s uses a third-party platform, School and Student Services (SSS), to process our financial aid applications. SSS will ask you to fill out an online Parents Financial Statement (PFS). Based on the financial information you provide on this comprehensive form, SSS reports to schools an estimated amount your family can contribute towards tuition. This estimate helps our financial aid committee make a fair and objective financial aid decision. The SSS PFS is available at sss.nais.org after November 1. Financial aid applications are due to St. Andrew’s by February 15. 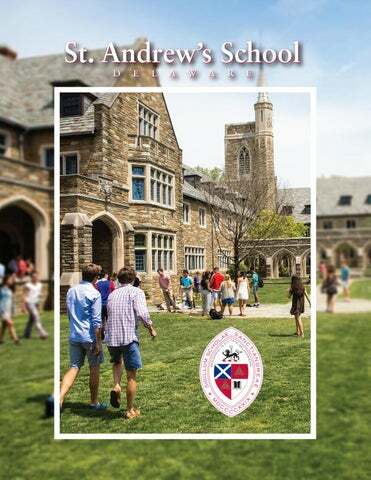 Visit standrewsde.org/financialaid for a step-by-step guide to filling out your PFS and for further information on St. Andrew’s financial aid policies and process. Each year we enroll 75-85 new students in 9th-11th grades. The admission process begins the year before the desired entrance year. Any student with strong academic interests, and a desire to take risks and accept challenges, should inquire. Generous need-based financial aid is available to all students who qualify. We seek religious, racial, ethnic, geographic and socioeconomic diversity in our applicant pool and welcome interested students from all backgrounds. What strikes many visitors most powerfully as they arrive at St. Andrew’s is the sheer physical beauty of our campus and its adjacent fields, woodlands, and waterways, all teeming with wildlife. We strive to connect our students with St. Andrew’s land through the opportunities for outdoor recreation (hiking, boating, swimming, and general exploring) that are at their fingertips, while also creating in them a deep and enduring sense of environmental awareness and stewardship. Our campus is a living classroom. The countryside in which we are situated is typical of the rural Atlantic coastal plain: low sea level, and lots of waterways, marsh, and agriculture. Our main campus is situated on 2,100 acres of woods and farmland (with two working farms operating on St. Andrew’s property) surrounded by water: Silver Lake and Appoquinimink River border campus to the north, while the twomile-long Noxontown Pond frames campus to the east and south. Inspired to protect our beautiful campus, and recognizing that environmental issues are going to be among the toughest challenges that today’s students may face in their later lives as citizens and leaders, we have committed to improving the sustainability of campus operations, engaging our students in the fight for environmental sustainability and preservation, and living and teaching environmental responsibility. S u s ta i n a b i l i t y Environmental stewardship on campus is led by a passionate and dedicated group of students, faculty, and staff. Our Green Council, a group composed of administrators, students, faculty, and facilities and dining services staff, and student-led Environmental Stewards ensure that environmental sustainability is a consideration in decisions at every level of School life. The Green Council recently created a five-year sustainability plan for the School, which covers 10 different sustainability topics, including curriculum and residential life, climate and renewable energy, transportation, water, land use, food and dining, and diversity and affordability. Current initiatives include: u CLIMATE CHANGE The School actively works to reduce our carbon footprint by using renewable energy such as our 50kW solar array, implementing energy efficiency projects in School buildings, purchasing efficient vehicles, and supporting green building practices. u FOOD AND COMPOSTING More than 30 percent of food served in the Dining Hall is from local, sustainable sources, and food waste from the Dining Hall is composted in the School’s organic garden. u ORGANIC GARDEN With several garden beds, tilled acreage and a 1,000 square foot greenhouse, students in our organic garden program learn gardening habits and grow produce and herbs for our Dining Hall and local food banks throughout the year. u PURCHASING St. Andrew’s strives to purchase sustainable products like Green Seal-certified cleaning products and 100 percent post-consumer recycled content paper. u LAND USE We steward our 2,100 acres of land by: ¤ working with our farmers to protect Noxontown Pond; ¤ conducting reforestation efforts on our farmland; and ¤ controlling the spread of invasive species. OUR LOCATION We are located in the mid-Atlantic region, one hour south of Philadelphia; two hours east of Washington, D.C., and fewer than three hours from New York City. Our location puts us within easy reach of the educational and cultural resources of these cities. An in-depth look at St. Andrew's School, a co-ed all-boarding high school in Middletown, Delaware.